I recently had to refactor functionality where a user could export historical data as CSV files. The original implementation, part of a bigger Rails app, would schedule a background job to generate potentially big CSV files and send them to the user as email attachments. This worked for a few years, but as the data grew it became problematic because it required loads of resources just to load data and generate files in memory, email deliverability was inconsistent, it wasn’t as flexible as required by users and it made the codebase more bloated and brittle than necessary. As part of a general move towards a more Microservices-style in the architecture of this application, I had already built a REST API that exposed the same data as paginated JSON collections, so I decided to leverage that and build a separate small proxy process that would gradually load all pages for a given query and assemble them into a streaming download of CSV data. The user selects one or more filters and submits a form to the Rails app. 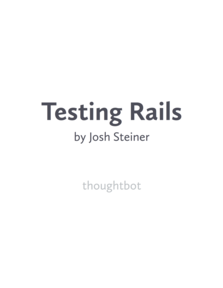 The Rails app generates and redirects to a URL for the Streaming CSV Service. The Streaming CSV Service makes one or more page requests to the REST API, piping results back to the response. The browser initiates the file download as the data continues to stream. When the last page is streamed, the server closes the connection. The concept is simple but the implications important: it means that the proxy process transforms the data and flushes it to an open connection as it comes, 1 page at a time. There’s only 1 page worth of data held in memory at any given time so there are no technical constraints as to how much data can be downloaded. At the same time, all of the data-lifting is handled by a regular request-response API in the backend. While the paginated REST API is written in Ruby, I decided to write the streaming-downloads proxy in Node.js for its nice Stream interface. I abstracted the pages-to-stream pipeline into a stream-like object that can be piped into other modules that implement Node’s streams. I use this along the ya-csv module to compose an API -> ApiStream -> CSV -> HTTP response pipeline. I also send the Content-Disposition: attachment response header to force browsers to pop up the download dialog to users. So I introduced a mapping layer in the pipeline that maps fields in the API JSON responses onto one or more CSV rows. Mappers could be streams themselves but for now the code is clear enough that I didn’t feel the need for it. API response mappers are a useful pattern not only because they allow clean data transformations but also protect the rest of the code from changes in the API data structures. This is a pattern that I’ve reached for before in Ruby in the form of my [HashMapper gem] gem. The original implementation only allowed to download the full data set for each resource type (orders, products, contacts). The new REST API can filter by things like date and price ranges, statuses and even geo-location, so I wanted to expose the same fine-grained control to the CSV downloads service. This is easy because I just need to forward parameters onto the API and map the returned data, but I also wanted sensible defaults for missing parameters. For that I introduced a parameter-declaration layer. I use param declaration objects to filter the incoming query string and apply validations and defaults before forwarding them to the backend API. Again, param definitions are a useful pattern for all sorts of apps. I wrote the Parametric gem to help with that in Ruby apps. This action is executed by a simple HTML form and redirects the browser to the Node downloads app, which in turn responds with a Content-Disposition: attachment header that commands the browser to initiate a streaming download. The Node app uses a custom middleware function to validate the JWT token and decode the API parameters. Tokens are only valid for a few minutes from the date encoded in the iat (Issued At) parameter. Use proxy processes to transform existing APIs into customised streams or data formats. Apply a language-agnostic approach where each service uses the best tool for the job. Apply patterns such as mappers, streams and parameter definitions to compose light-weight declarative data pipelines. Leverage simple standards and libraries such as JSON Web Tokens to secure your micro services. Update: These are the slides for a talk on this subject at the London Node User Group, 23 April 2014.